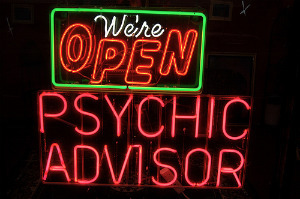 Recently my wife has been talking to a psychic. The psychic claims to communicate with my wife's deceased father. My wife is desperate to believe her, but I disagree. I would like to explain to my wife that it is common to call for guidance from a father spirit during crisis. Examples that come to mind immediately are Jesus in Gethsemane, Superman and his father Jorel, not to mention Greek Mythology. My question is, is there a recognized term for this phenomenon, and if so can anyone elaborate? I think my wife is being hoodwinked, and I think psychics who do this are preying on people who are at a weak point in their lives. Comments?